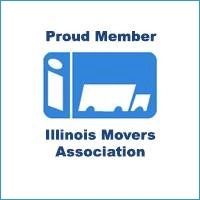 Easy tips for packing & chicago moving storage, office relocation moving services, USA professional Local & long distance movers, order boxes and furniture packages, piano & household shifting services. Summer is "peak" moving season. If you can be flexible about when you move, don't wait until the summer. 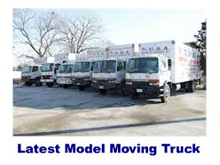 Also keep in mind that the first and last weeks of the month are extra-busy for all movers. Before you move, eliminate what you don't want or need. 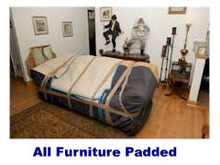 DO NOT apply a heavy coat of wax to your furniture before the move. A pad or a blanket can leave marks in the finish that may not come out later. 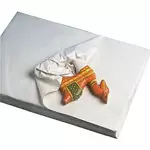 The wax can also become slippery, which could cause the worker to drop the piece or incur an injury. If you are doing your own packing, be careful about overloading the cartons. If you cannot lift the carton easily, it is too heavy! Try to keep the weight of a single box to under 50 pounds. Do not pack all your books in one big carton—it will be too heavy to move! Be sure to use appropriate cartons so your goods will arrive safely. 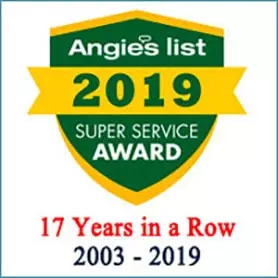 (Plastic trash bags are not appropriate cartons) Carton tops should be flat and taped securely for easier (and quicker) handling and safe and efficient stacking in the truck. To avoid damage, be sure fragile articles are not packed in the same carton as heavy articles. Be sure to mark cartons clearly. Unplug your TV's and computers at least 24 hours before the move. This "cool down" period will help stabilize the working parts and help prevent damage. Carry your valuables (jewelry, furs, money, etc.) medication, and important papers with you—do not pack them in the moving truck. 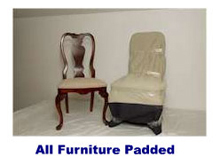 Your contract will specify that the mover is not responsible for these items. Remember, it's "first in—last out" when loading any truck. Keep toiletries, medicines, and other necessities with you in the car on moving day. Label all boxes well. Remember to label all boxes with the room destination (LR = living room, DR= Dining Room, etc.). 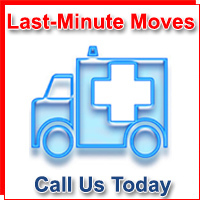 This will help direct the movers to the correct room without delay. Also, mark all fragile items well! The better a box is marked, the less chance of damage to fragile items. How To Pack Specific Items? Begin with the larger items. Smaller items can go toward the top. Wrap each piece individually with several pieces of newsprint. Next, wrap three to five previously wrapped plates together and stand each bundle on its edge. Never lay them flat. Add 3-4 inches of crumpled paper and a cardboard divider before creating a second level. Always individually wrap and never put one piece inside another. Place on the very top level of your carton and pack rim down. 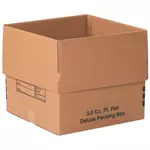 Especially fragile items should be packed in a separate carton and then packed in a larger carton surrounded by cushioning. 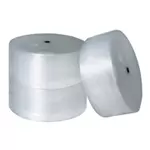 Wrap individually and then nest two to three together and wrap as an entire package. Place on end or flat. Use crumpled paper and a cardboard divider before adding layers. Remove shade, bulb and harp assembly. Double wrap the bulb and harp assembly. Wrap the base and cushion it in a dish pack or similar type box. For lampshades, select the carton size close to the shade measurements. Pack only one shade per container. Don't use crumpled newsprint inside or around the outside of the shade. Glass lampshades and chandeliers should be professionally packed in sturdy crates. Of course, never pack perishable items, aerosol kitchen products or frozen food. Box dry foods in medium-sized cartons after taping any openings or tops closed. Jars should also be taped shut and wrapped as well as cushioned. Pack cans and jars in smaller cartons. Clothing can be left in sturdy dressers or packed in suitcases, if desired. 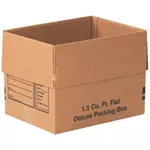 Other foldable clothing should be packed in medium-sized cartons. 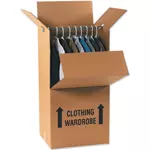 Hanging clothing should be packed in wardrobe cartons available from your USA Moving and Storage. 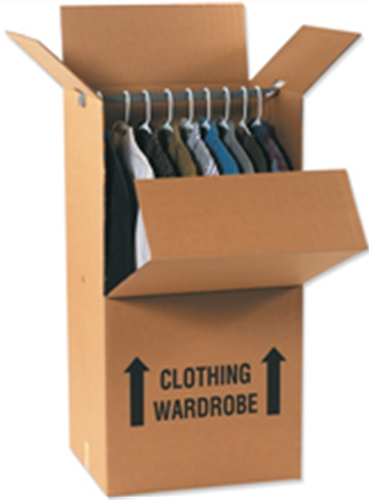 If wardrobe cartons are not used, be sure to remove hangers and pack in lined cartons. Hats should be left in their boxes and packed in moving cartons. Small cartons loosely filled with newsprint also help protect hats. 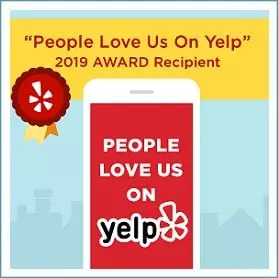 Mirrors, Glass Table Tops, Pictures, Paintings, etc. 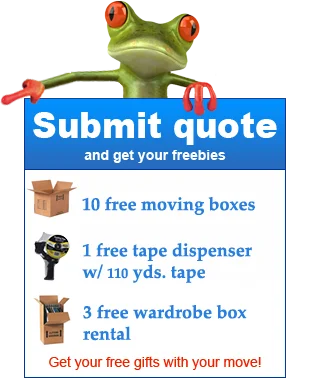 We recommend purchasing special cartons for all but the smallest items in this category. 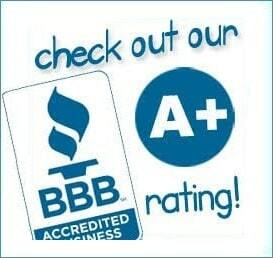 Mirror and picture cartons can handle most items. Only one article should be packed in each carton. 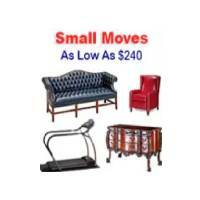 You will want to consider professional crating assistance for oversized or heavy items such as table tops. Wrap individually. Cups with handles should be cushioned with another layer of paper. Pack with rims down. Cushion and layer with crumpled paper. 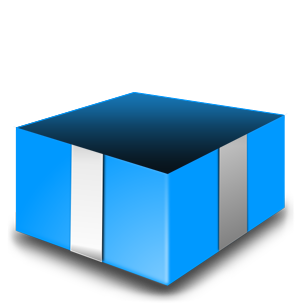 Pack in smaller boxes with open edges alternating with the bindings. Hardback books, or those with fragile covers should be wrapped for protection. Wardrobe cartons are excellent for hanging curtains and drapes. You can also fold them and pack in cartons that have been lined with clean newsprint. 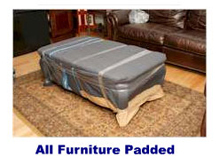 Mattresses must be covered to protect them from soil and damage. 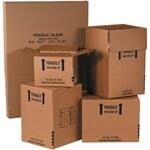 Appropriate sized cartons are recommended and available from your USA Moving and Storage. Clocks, radios and other small appliances should be individually wrapped and packed along with linens or towels or surrounded with crushed paper for protection. Original manufacturers packaging with styrofoam inserts provides the best protection for moving electronic goods. 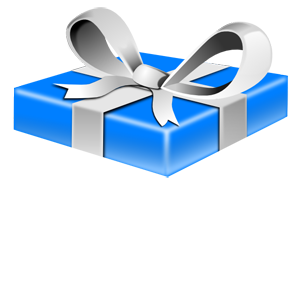 If these are not available, large or medium cartons should be used and the item well wrapped and cushioned. Larger home electronics such as consoles and large screen TVs should not be packed and will be moved as furniture. Computers and grandfather clocks require special pre-move preparation. 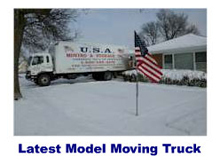 Consult with your USA Moving and Storage or a local dealer to determine what is required for moving these items. Washing machines should have all hoses disconnected and containerized. If you place hoses in the tub or drum, be sure to wrap the metal couplings with cloth or paper to avoid damage to the tub's surface. Unplug the electric cord and tape to the back. 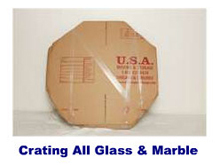 Secure the washer drum with materials available from your USA Moving and Storage. 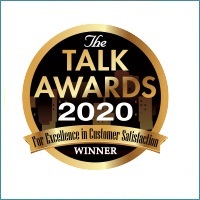 Many appliances require special servicing, disconnecting and preparation. 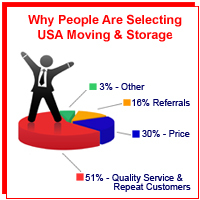 Upon request, your USA Moving and Storage will arrange third party services to prepare these items for your move. You may be able to perform most of the requirements yourself. Refrigerators should be emptied of all food. Shelves should be secured in place or detached and wrapped. The electric cord should be unplugged and taped to the back. If there is an icemaker, it should be disconnected from the water line and drained in advance.